Rameshwaram is one of the holiest place in India for the Hindus. It is an island located in Tamil Nadu off the east coast, it is one of the 12 Jyotir Lingams - the most sacred spots for Shiva worshipers. This illustrated history of the holy city of Rameshwaram - taken from the epic Ramayana - recounts the legend of Lord Rama, Lakshmana, Sita and Hanuman, who worshiped the Shiva Lingam on the southeastern coast of India to rid themselves of the sin of killing Ravana - the King of Lanka. After forging a friendship with Sugriva through the mediation of the mighty apes, Lord Rama sends Hanuman in search of his abducted wife Sita. Hanuman goes to Sri Lanka, locates Sita and delivers the message of Rama and brings back as a token her head ornament chudamani to Rama. Having learned about the whereabouts of Sita, Lord Rama decides to proceed to Lanka. He sits in meditation praying to the Ocean God Samudraraja to make way for him and his army. Annoyed with the delay, he takes the bow and gets ready to dart the arrow against Samudraraja. The lord of the oceans surrenders and shows the way for the construction of a bridge across the sea. While Lord Rama is busy supervising the construction of the bridge, he noticed a squirrel wetting its body. Then rolling in the sand and taking the sticking sand to be added to the bridge under construction. While Hanuman and his ape associates are engaged in the building of the bridge, the squirrel contributes its share to the construction work. A grateful Lord Rama blesses the squirrel by caressing its back thereby forming three streaks. This gave rise to the story about how the squirrel got those white lines on its back! After the bridge was constructed, Lord Rama, Lakshmana, and Hanuman reached Sri Lanka. Seated in the chariot of Indra and armored by the Aditya Hridaya Mantra of sage Aghasthya, Rama and succeeds in killing Ravana with his Brahmastra weapon. Having vanquished Ravana, Lord Rama crowns Vibhisana as the King of Sri Lanka. Later Rama reached Gandhamathanam or Rameshwaram with Sita, Lakshmana and Hanuman in a swan-shaped viman or mythical aircraft. At Rameshwaram, Lord Rama was praised by sage Agasthya and other saints, who had come from Dandakaranya. He asked Agasthya to suggest him a way to get rid of the sin of Brahmahatya Dosham, which he has committed by killing Ravana. Sage Agasthya suggested that he could escape the evil effects of the sin if he installs and worships a Shiva Lingam on that spot. According to the suggestion made by Sage Agasthya, Lord Rama decided to perform the ritual worship or Puja for Lord Shiva. He orders Hanuman to go to Mount Kailash and bring him a Shiva Lingam. While Hanuman was trying to bring them a Shiva Lingam from Mount Kailash, Lord Rama and Lakshmana watched Sita playfully make a lingam out of the sand. Hanuman, who had gone to Mount Kailash to bring the Shiva Lingam has not yet returned even after a long time. As the auspicious time for the Puja was fast approaching, Sage Agasthya tells Lord Rama to perform the ritual worship to the Shiva Lingam that Sita made out of the sand. 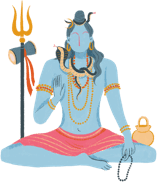 Unable to meet Lord Shiva at Mount Kailash and procure the lingam for Lord Rama, Hanuman goes through a penance and then obtains two Shiva Lingams from the Lord himself after explaining the purpose of his mission. Hanuman flies to Rameshwaram, which was popularly known as Kanthamathanam, carrying the two Shiva Lingams obtained from Lord Shiva himself. After reaching Rameshwaram, Hanuman finds out that Lord Rama had already performed his Puja, and is disappointed that Rama will not perform the ritual to the lingam he brought from Mount Kailash. Rama tries his best to console him and asks Hanuman to install his Shiva Lingam in place of the sand Shiva Lingam if he can. Unable to remove the sand Shiva Lingam by his hands, Hanuman tries to pull it out with his mighty tail. Failing in all his attempts, he feels the divinity of the lingam that Sita made from the sand of the Dhanushkodi beach. Lord Rama then asks Hanuman to place the Vishwanatha or Shiva Lingam on the northern side of the Rama Lingam. He also ordains that the people should worship Ramalingam only after worshipping the lingam brought and installed by Hanuman from Mount Kailash. The other lingam is placed for worship near Hanuman’s deity at the temple entrance. Even to this day, worshipers follow this prescribed order of worshiping the lingams.